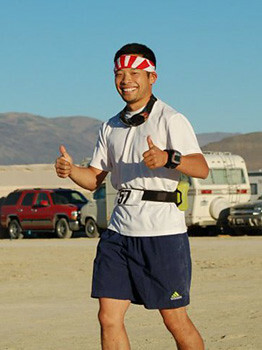 Sho Ikeda was a first time Burner this year and, rather than sit around taking in the sites, sounds and smells of Black Rock City, he ran a 50-K Ultramarathon. He lived to tell the tale and the words below are his. You can find out more about Sho over at shoikeda.net or Rennie's Landing Restaurant and Bar in Eugene, Oregon. I had a few friends who were veterans of Burning Man and I decided that, with my 30th birthday earlier this year and a planned return to school, this was a good time to check it out for myself. A place full of transitions for a time of transition for myself. Now, I thought I would do a little running while I was there to stay on pace with my training schedule for the a Portland Marathon. While I wasn't planning on doing the 20 miles that was scheduled, I was thinking I'd do a few short runs and maybe a 10 miler. Then I found out about the inaugural Burning Man Ultramarathon. I can't remember how I first heard about the race. It may have been through Twitter or a Wired article, but I found the Facebook page for the ultramarathon and checked out the details for the 50 k (31 mi) race. At first, I figured I'd just volunteer and help out some fellow runners. Then I thought I would run about 20 miles and then volunteer the rest of the time. Finally, a few days before we left for Burning Man, I decided that I would try to run and walk the whole thing. So, fast forward to the morning of the race. It was a Wednesday, the third day of the festival. I had done pretty good job refraining from alcohol and other substances and got a few hours of sleep despite the thumping bass from a distant dance-club-themed camp. At 5 am, with my fuel belt full of Heed and my trusty Garmin, I ran out to the center of Black Rock City (the name of the city that is built around the Man) to meet the other runners under the Man himself. There was a group of about 30 of us huddled around the race director, Cherie, while she showed us a map of the course. The map had been available online, but I had forgotten to print one out and it hadn't looked very complicated anyway. However, it was still very dark outside and the second turn supposedly indicated by a group of tiny flags. Flags, which Cherie mentioned may have been removed by the Department of Public Works (the Burning Man infrastructure crew) over the night. I figured I would be able to keep up and follow all the runners, especially since most of us were wearing headlamps and other lights. Needless to say, once the race got underway, I quickly fell to the back of the pack. Ultramarathoners--*surprise surprise*--are in excellent shape and rather fast. I had to keep a faster pace than I had planned in order to keep everyone's lights in sight. Soon the first turn came and I tried to keep an eye out for the flags for the next turn, *if* the flags were still there. At this point, I silently asked the Burning Man gods and other deities for any kind of guidance, or at least to make sure I didn't end up completely lost in the desert. At the very least, there was a trash fence that made up the perimeter of Black Rock City, and that would keep me within range of the course. It was at this point I came upon a fellow runner who seemed to be looking at--yes!--a map! I ran up to him and asked if he knew where we were on the course. He wasn't quite sure, but with the map and a bit of orienteering, we figured out a mostly-in-the-right-direction path for the second turn despite not seeing any flags. This young man, who called himself "Windy" (which is appropriate for the duststorm-prone Black Rock Desert), and I ran together for a while. He was dressed in a long skirt (skirts are rather popular on both men and women at Burning Man; very comfortable) and Vibrams, and was a veteran of a few marathons and ultramarathons. He stayed with me for the first full loop so that I could get my bearings, even though I was a much slower runner than him. After the first loop (of five), which was about 6 miles, we stopped at the aid station where there were loads of goodies donated by fellow runners (I donated some water, myself). This included some peanut-butter-filled pretzles, which quickly became my favorite of the race. Windy and I then went our separate ways so that he could run his own, faster pace. Now that the sun was starting to rise, I could more easily find my way around the course and I saw that the little flags *were* there; it had just been so dark that most of the runners had missed them. As the race continued, I would see hungover burners heading back to their camps, many of whom seemed either confused or bemused that there was a marathon--no, an ULTRAmarathon going on. A lot of passersby would cheer me on or give me a high five. There was even another aid station that wasn't associated with the organizers; a group of folks just wanted to help out! One ammusing group of guys manned a booth that contained a loudspeaker, and they shouted insults and taunts at everyone who passed by, including us runners. The really great thing about Burning Man is that there's really no boring part of the course. There's tons of art, colorful tents, colorfully dressed people, music, etc. The first half of the ultra actually seemed to go by rather quickly. During the second loop, I made a quick stop at a medical station to add some tape to a blister that had developed the day before from wearing some rarely used hiking boots. The blister wasn't bothering me at all, but I wanted to make sure it stayed that way. So far, the race had been pain free, but right at about mile 18, I had to take my first of many walking breaks, which really added time to the race. My left shin began to ache along with other parts of my legs. My pace went from a jog to something more like a shuffle and I had to walk more and more often. This was where I just had to grit my teeth and keep going. Why? I don't know. There was no shame in quitting; I had heard from the aid station that some experienced runners had dropped out. This wasn't a race that I had as a goal; unlike the Portland Marathon. It was just that, at mile 26, I knew I had completed a marathon. I only had five miles to go, and I would be an ultramarathoner. Someone who was at his first Burning Man *and* who had finished his *first* ultrmarathon; the *first* Burning Man ultramarathon. There was no doubt, I had to finish. On my last loop, I passed by the group of hecklers one more time. As I was wearing a Japanese rising sun bandana, much like the one worn by the Karate Kid in the tournament, the guy manning the loudspeaker shouted, "Hey Daniel Caruso, why don't you come over and get a drink!" At this point, alcohol probably would have been a terrible idea, but I figured I may as well say hi to these hecklers. To my suprise, they cheered when I started to make my way over. One heckler poured me a tall glass of what I think was a screwdriver. "This will probably kill me," I said. The bartender replied, "Running will probably kill you." "You're probably right," I said, "might as well." So I chugged the drink and gave the group my thanks. Suprisingly, I think the drink may have helped by numbing a bit of the pain! With one mile to go, my eyes focused on the ground in front of me, pushing through people going about their day, I noticed someone to my right. It was Matt, my friend who convinced me to come to Burning Man. Apparently, he had been riding his bike next to me for the last minute or so and I hadn't even noticed. He and my other friends from my camp had gone to buy ice and had seen me running, so they came up and cheered me on. With that final boost of motivation, I shuffled along the last stretch of the course and came close to the base of the Man, where Cherie and a couple other volunteers were waiting. Cherie gave me a big hug and a handmade medal made from a round slice of wood, sharpie pen, and ribbon. Never had such an simple medal looked so valuable to me. Unsuprisingly, I was the last finisher of the race; but, the important word of that sentence was that I was a *finisher*. With a smile on my face, I wobbled to the base of the Man where I rested and sipped on some water, blissful and happy that I was done. Then, it slowly dawned on me: I still had walk back to camp. So, I guess I ran and walked *32* miles that day!